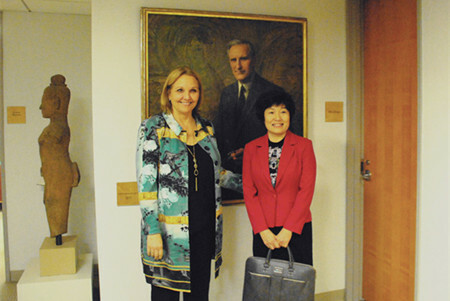 On February 4th, Consul General Zhang Qiyue visited Asia Society and brief its members on China-US relations, China's economic development, anti-corruption campaign and the Chinese Dream. She met with President Josette Sheeran before the session. President Sheeran stated that Asia Society has long been committed to promoting exchanges and cooperation between the US and Asia in culture, arts, education and business and wishes to work together with the Chinese Consulate General to promote mutual understanding between the two peoples. Consul General Zhang commended the efforts by Asia society and expressed the hope for Asia Society to help the Americans get a better understanding of China.